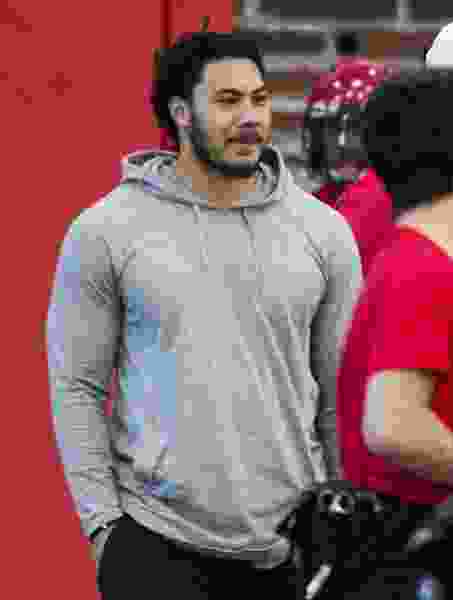 Former BYU linebacker Francis Bernard made a trip to Utah’s campus for the first day of spring football, but he’s far from decided on his future. Bernard stood on the field in a hooded sweatshirt watching drills on Monday when the Utes opened their spring practice period. The 6-foot-1, 240-pound former Herriman High School standout told The Salt Lake Tribune this week that he hasn’t made any decision about a potential transfer for this fall. “I was just up there more looking at my options,” Bernard said. BYU suspended Bernard and asked to redshirt the 2017 season in August due to honor code violations. At that time his brother, James Bernard, told The Tribune that Francis Bernard wanted to transfer to Utah but was having trouble getting a release from BYU. In October after Bernard was arrested on suspicion of DUI, BYU coach Kalani Sitake revealed that Bernard had asked for and granted his release to any school in the country several weeks earlier. Bernard never enrolled in fall classes at BYU. Bernard, who served an LDS Church mission prior to college, played for BYU in 2015 and 2016. Bernard was one of BYU’s most reliable defensive players on the field in 2016. The former running back turned linebacker finished the year with 80 tackles, 5.5 tackles for loss, two sacks and three interceptions in 12 games that season. Bernard missed the 2016 Poinsettia Bowl win over Wyoming, suspended for violating team rules. This week, Bernard told The Tribune that he’d been taking online classes toward earning his associate’s degree at Rio Salado College in Arizona. He hopes to finish his degree requirements by the end of June and be able to transfer to a program in time for preseason camp. As long as he completes his academic requirements, Bernard believes he’ll be eligible to play this coming season. He said he has received interest from several schools, but declined to identify them. He likely will not decide on a school until the summer. He said he’s made it clear to any schools that have expressed interest that his primary focus is completing his associate’s degree. While Bernard says he’s not leaning toward any school at the moment, his potential addition would boost a Utah linebacker corps thinned from graduation in 2017. The Utes lost starting linebackers Kavika Luafatasaga and Sunia Tauteoli, the team’s top leading tackles from last year’s 7-6 team. To help offset those losses, the Utah coaching staff moved strong safety Chase Hansen to linebacker. Reporter Christopher Kamrani contributed to this story.